Often when we hear about a friend or loved one getting a divorce, we just don’t know what to say or do. We want to be supportive, encouraging, helpful – but struggle with being presumptuous or intrusive in our attempts to offer assistance. Recently I was invited to speak at a Stephen Ministry meeting when the group was going through training on how to minister to and assist people in the community who are dealing with divorce. The group leader asked me to help them understand the process of divorce and suggest ways to help those going through it. After two decades of practicing Family Law and working with men. women and children who are going through the process, it wasn’t difficult to come up with a list of challenges that divorcing parties often need help with! When making an offer of help, be specific. While saying things like Please call if you need anything or Let me know if I can help, may be sincere offers, they’re generally not helpful offers. Such statements shift the obligation. They require the person needing assistance to initiate contact and request a favor. Many are not comfortable with one or both of those actions. Here are some suggestions for specific offers to make and actions to take during the different stages of divorce that can lighten the load a bit for the divorcing friend – whether male or female – you seek to help. Encourage your friend to see a counselor if she seems to be struggling emotionally. 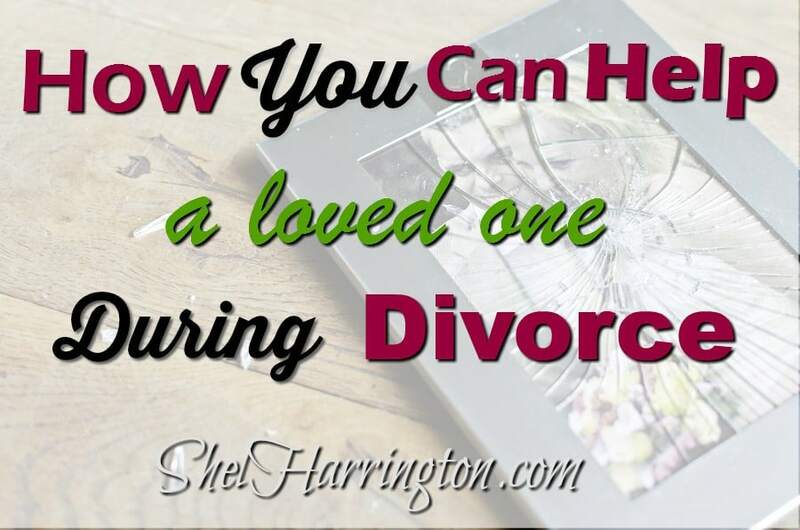 Whether your friend wants the divorce or not, there is much to deal with and process. Not only her own feelings – which may include combinations of sadness, grief, fright, guilt, abandonment, loneliness, depression, confusion, bewilderment, anger, rage, jealousy, vindictiveness, relief, happiness, optimism – but the feelings of her children, friends and family members have to be dealt with. Even if your friend seems to have a good support system of friends and family, it is helpful to have someone to talk to who is not vested in the situation. In other words, a counselor doesn’t love your friend. He’s an objective ear trained to listen and provide feedback and tools to help one navigate evolving situations. A counselor doesn’t start out with a bias about whether or not a divorce or reconciliation should take place, and he doesn’t have an existing opinion about a spouse. Counselors have the ability to assist from an objective viewpoint – something family and friends often aren’t able to do. Encourage your friend to seek the advice of a Family Law attorney. Just because you get information from an attorney doesn’t mean you have to get a divorce. It is a way to understand what one’s legal rights are with regard to custody, child support, property division, alimony and, in cases where domestic abuse exists, protective orders. It’s also helpful to understand how the process of divorce works in the legal system so that one can have realistic expectations if matters go forward. In addition, an attorney can provide helpful tips regarding behaviors that help or hurt a case during the process. For tips on finding a good Family Law Attorney, click HERE. Offer to go with them to a consultation. Meeting with an attorney can be intimidating for some. Your friend might welcome the moral support of your presence – and a second set of ears can be an asset. It’s easy to miss information offered if one is still processing what they have heard previously, are focused on what they will ask next, or are dealing with their own nerves. Focus on faith. If prayer is meaningful to your friend and something you are comfortable with, ask what she would like you to pray specifically about. The answer may surprise you – as well as give you insight into additional ways you might be able to assist. Go with your friend to observe a similar court proceeding, conducted by the Judge assigned to his case, prior to his own matter being heard. Seeing the courtroom environment ahead of time, witnessing the judge’s demeanor when the focus is on other parties, and seeing how the process works can help alleviate fear of the unknown and diminish trial day jitters. Ask if they would like you to attend their hearing to be moral support in the courtroom. Such hearings can get personal, so you should ask if they would be comfortable with you there, but often those who would normally be their moral support are also witnesses who will not be allowed to stay in the courtroom with them. Take their children for an outing. During a divorce, a parent may have to sort through property that is going to be divided and/or pack up belongings. Some of these chores are less difficult to do when the children are not present. Provide an easy meal – something that can be warmed in one container or frozen if not eaten immediately. This is a gesture that will be well-received on long work days, court days, or as a “thinking of you” gesture. Let them know you remember. A quick phone call, text, email, etc. on court day or the night before to let them know you are thinking of them and/or praying for them will be appreciated. Gift them comfort. Provide a small object they can feel in their pocket to remind them they’re not alone, such as a medal, worry stone, cross, shell or an inspirational saying. Gift them whimsy. Drop off or send a whimsical lift-your-spirits gift such as a flowering plant, funny book (The Best of Herman is hard to beat! ), or a silly refrigerator magnet. Check the dates. Find out if there any special dates coming up – birthday, anniversary – that might be especially difficult or lonely for them. A lunch outing or enjoying a light movie together might be a welcome invitation. Acknowledge a final Order doesn’t mean finality. Often the moral support team drifts away after the “crisis” is over. But changes for those who are recently divorced are ongoing. There may be financial struggles, parenting issues and other challenges which result from one person running a household that used to be run by two. The occasional just-checking-in/thinking-of-you/praying-for-you type communication will be appreciated. Remember them on holidays. If they didn’t have children and local family, some of those first holidays can be lonely. If they do have children, the holidays the children spend with the other parent can be very difficult. Babysitting needs are ongoing. Especially for parents who have the children full-time because of the other parent’s unavailability due to court restrictions or geographic distance. Some of the weekend or after-daycare-hours needs for childcare help include counseling sessions, support-group meetings, and educational pursuits. The ultimate gift for those recently divorced parents may just be whisking away their kids for a time, thus enabling the parents to revel in the luxury of having their home – and potentially an uninterrupted bubble bath – to themselves for a few hours! Great advice Shel. You are amazing! Awww, you’re making me blush – thanks, Debbie! Terrific advice, Shel! I especially like the advice about the final order. For some, the entry of the final order is only the beginning. Good advice Shel I think taking the children whilst the grown ups talk things out is a very important one. The poor kids get forgotten sometimes in the middle of all the drama and they don’t need to be there in all that negativity either. No easy answers but I will remember many of these when a friend is in need. You’re so right, Kath – no easy answers on any of it. The best we can do is keep the kids out of it as much as possible – which sometimes takes a pal stepping in to offer some respite!